This past photo week I wanted to take a closer look at some photo printing options that broke the mold, as it were, and thought outside of the box. While the average photo sharing site offers a number of size and formats, including books and posters, I was wondering what there was out there for the artistically inclined DIYer without the wherewithal or ability to paint actual pictures. To that end I found myself at CanvasPop, a website dedicated to putting your photos onto canvas, thereby cutting out expensive middlemen like Pablo Picasso or Peter Paul Rubens. CanvasPop and its decidedly strange sister site, DNA11 (more about that later), are all about large format photography. Prices max out at $419 for a 24×72 inch canvas picture on a 2.5-inch frame and start at $30 for an 8×10 unframed. You can add effects and filters and most photos will work, including cameraphone pictures. You can also split photos onto multiple canvases, thus allowing you to add a whole West Elm feel to your pictures. I requested a fairly bold photo on a standard sized canvas and the results were quite impressive (see above). 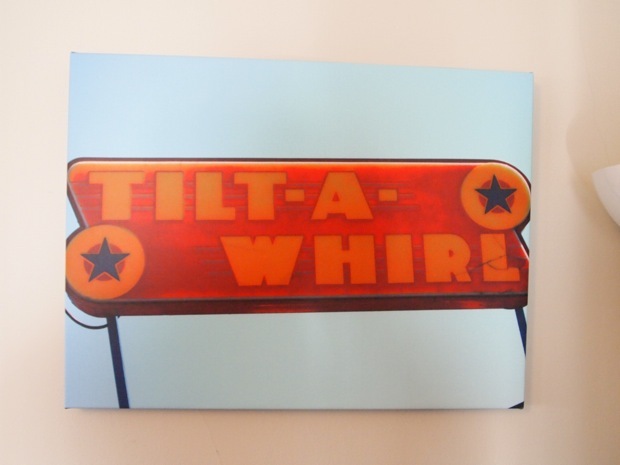 The photo, of a Tilt-a-Whril sign in Coney Island, had all of the standard symbolic accouterment of the classic artistic photo taken by someone without an artistic eye. Sadly, I could not take a black and white picture of a bike in a puddle of water in time to add it to my order. The resulting canvas was a bit washed out but generally it looks very nice. The blue is as bold as it was on the screen and, while the orange and reds weren’t as vibrant on canvas, they still do quite a bit to offset the boredom and tedium of the room. Remember: keep your photos in focus. Out of focus shots printed at this size result in big blurry blobs of color, a result that some may actually cherish but is usually horrible. Obviously CanvasPop has more apparent utility than DNA11, but both are interesting services for the professional and dilettante interior designer. Considering the price of photographic art these days – some dumb pictures of trees were just found to be worth $200 million – it behooves the homeowner to perform a little artistic DIY, especially considering the economy. UPDATE – CanvasPop wanted to offer you guys a 10% discount. Type in “techcrunch10” when you place your order.